You have probably heard about auto installer scripts that will quickly install a script into your hosting account with a simple click or two. All you have to do is pick the script you want, click install and provide the location you want it installed. You probably pick a login and password, maybe a few other simple things like site title and that type of thing. Generally you can have your site up and running in a matter of minutes. Auto installers are very handy for people not that familiar with installing a new script. For people that might be familiar with how to install a script it is sometimes just faster or more convenient. I personally have never been a huge fan of auto installers. Sure they are quick and easy to use, but I just prefer to manually install something even if it takes longer. I like to see what is happening, and it is a good thing to learn. Although when it comes to installing Dolphin depending on your hosting setup and configuration it can take longer than many other scripts. Just setting all the file permissions (chmod) Dolphin requires with some setups can take a considerable amount of time. Other scripts do not require all the file permission changes and can actually be manually installed in less than 5 mins. So I guess it really depends on the script. Still it is good to learn the Dolphin installation process, and how and why the file permissions may need to be changed. Some auto installers add some configuration and settings files within your hosting account which can sometimes be difficult to get rid of if you ever want to remove the particular script. 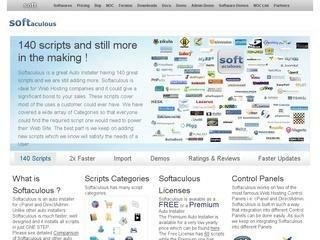 You've probably heard of the Softaculous auto installer. Boonex seems to have partnered with them for their primary choice for Dolphin. I was looking at some of the other popular auto installers for cpanel hosting. One that has been around as long as I can remember is Fantastico. A lot of cpanel hosting providers had Fantastico and still do today. Fantastico was good in its day (years ago). I am not so sure anymore. I recently reviewed the list of scripts available in Fantastico and I can't believe they even install some of them anymore. There are quite a few scripts in Fantastico that are extremely old, no longer updated or even developed anymore. I am also not so sure that some of them are that secure after all these years with little or no updates. You would think they might get rid of some of the older scripts and no longer developed ones. How they compete with the other auto installers out there that seem to be more up to date I have no idea.